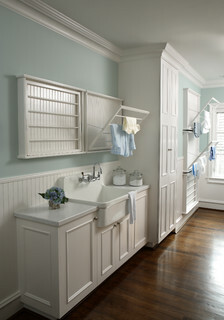 Do you have one of those laundry areas in a dingy, unfinished basement? Or do you perpetually have a big pile of dirty clothes on the laundry room floor, waiting to be sorted and washed? I believe the state of your laundry room is directly correlated with your feelings towards doing laundry, and that laundry rooms no longer need to be unpleasant places to keep behind closed doors. 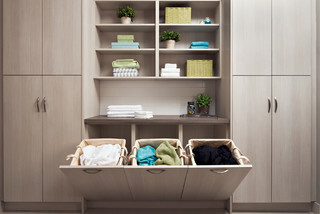 Whether you are looking to create a place where you will enjoy doing laundry, or just make it bearable, the following pointers will help you to create a beautiful, well-organized space. 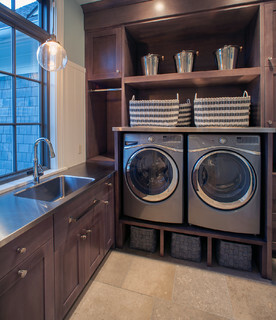 The fact that any well-organized laundry room should have a system for sorting is a no-brainer, but you may be pleasantly surprised at the many options available for sorting your soiled garments. I’m a dryer kind of girl – my preference would be to throw everything in the dryer and not have to worry about hanging anything up to dry. But let’s face it – certain things just shouldn’t be put in the dryer (I learned that the hard way). Having spent years putting up with one of those folding racks taking up space in the middle of my laundry room floor, I am thrilled with some of the options available now that are so much more space-friendly. When you have one of those dingy basement laundry rooms, you really don’t want to spend any more time there than you absolutely have to. 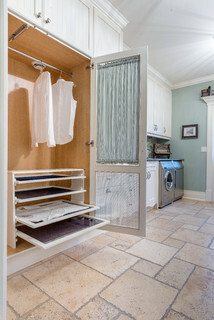 But now that you are going to have a bright new organized laundry room you are going to want to spend more time there. 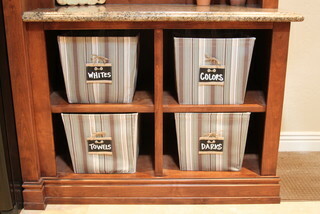 Let’s keep the laundry where it belongs and set yourself up properly with an area for folding and ironing. Closely related to folding is the task of ironing. 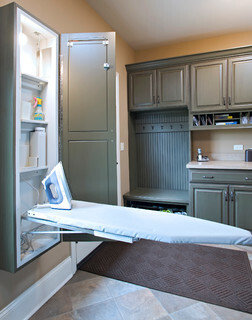 Now, who wants to pull out a clunky old ironing board and set it up, especially if you are tight on space? There are a couple of space-saving options. 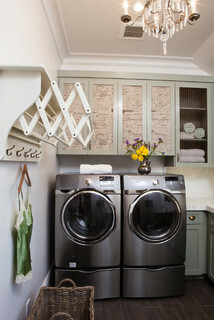 In parting I wanted to share another laundry room that we built for designer Suzette Toews a few years ago, which has some features that I absolutely love. It has a French Country flavour, with little decorative touches like the custom fabric valance over the window, the apron sink, and the decorative toekick on the sink cabinet. 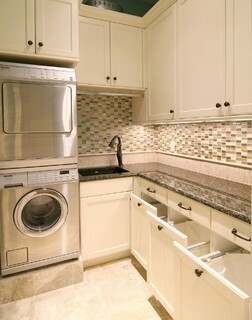 It really doesn’t look like a laundry room at all, does it? It’s so inviting. 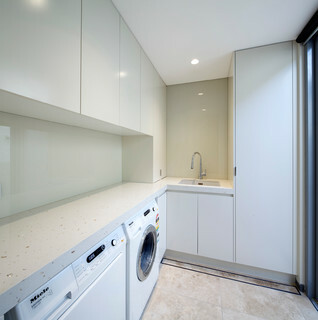 But my favourite part is the built-in washer and dryer! 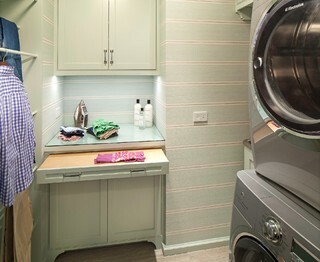 Seriously – how would you even know this is a laundry room? 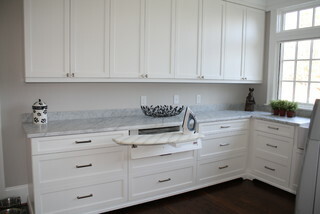 Do you need help solving your laundry room frustrations? We’d love to help. Call or email us today to book your free in-home consultation. 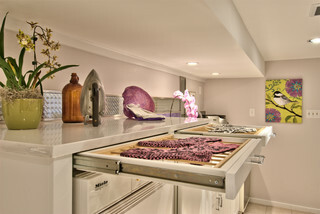 Indoor Gardens – The Next Kitchen Design Trend? Copyright © 2019 Casa Flores. All rights reserved.